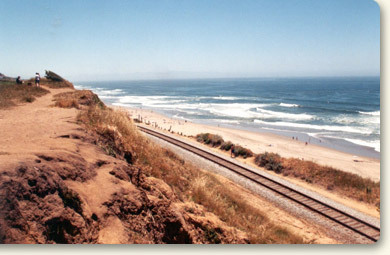 On October 12, 2012 — after more than ten years of extensive due diligence and negotiations — the RTC closed escrow for the acquisition of the Santa Cruz Branch Rail Line (Branch Line) from Union Pacific thereby placing a new transportation corridor in public ownership and beginning a new era of mobility options and opportunities. A community event to commemorate public ownership and demonstrate potential use of the corridor called Right on Track: Rail Corridor Ribbon Cutting was held on November 17 at locations throughout the county. Acquisition of this key transportation corridor will allow greater transportation options to the more than 80 parks, 25 schools and over half of the county’s population who live in census blocks within 1 mile of the corridor. 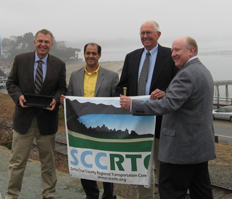 On May 6, 2010 the RTC unanimously decided to purchase the Santa Cruz Branch Rail Line for $14.2 million. On January 19, 2011, the RTC secured approval and funding from the California Transportation Commission for purchase of the Branch Line. On May 17, 2012, the RTC selected Iowa Pacific Holdings to operate freight and tourist passenger service on the Branch Line. Maps of the Branch Line are available online at the Santa Cruz County GIS map gallery under transportation. Hard copies are available for viewing at the RTC offices and free CDs are available by calling (831) 460-3200. The majority of funding for acquisition of the rail corridor was provided by California and Santa Cruz County voter approved Proposition 116 which specifically stipulates that it is for” rail projects within Santa Cruz County that facilitate recreational, commuter, intercity and intercounty travel.” The California Transportaition Commission released funds to the RTC with the condition to initiate recreational passenger rail service and a commitment to follow all Proposition 116 requirements. The tracks cannot, as has been speculated, be removed and replaced with a trail only. It is also noteworthy that the CTC has final approval over many other funding sources for transportation projects in Santa Cruz County including road and highway projects. April 11, 2016 Press Release from Santa Cruz & Monterey Bay Railway/Iowa Pacific regarding its commitment to continue to operate the railroad through the end of their contract in 2022. Right on Track: Rail Corridor Ribbon Cutting. A community event to commemorate public ownership of the Santa Cruz Branch Rail Line and new mobility options. Deeds transferred from Union Pacific and 32-mile rail corridor officially owned by the community. The federal Surface Transportation Board granted the RTC’s petition to acquire the Santa Cruz Branch Rail Line and move forward with closing escrow. At today’s meeting, the RTC authorized the selection of Iowa Pacific Holdings to operate on the Santa Cruz Branch Rail Line.